Why all the Fuss About Pie Crust? Who Likes Their Food Hot? Preheat a grill on medium-high heat. Whisk together the whiskey, brown sugar, 1 1/2 teaspoons salt and 1 teaspoon pepper until the sugar and salt are dissolved. Stir in 2 tablespoons of the oil and the garlic. Add the steaks, turn a few times to coat with the marinade and let stand at room temperature for 20 minutes. Meanwhile, quarter each potato lengthwise to form wedges and put in a medium pot. Cover with cold water to cover by 1-inch and add salt until the water tastes like sea water. Bring to a boil over medium-high heat, reduce the heat to medium and simmer until tender (but not falling apart), about 15 minutes. Drain well. Toss with 1 tablespoon olive oil. Remove the steaks from the marinade and pat dry with paper towels. Pour the marinade into a small pot and bring to a boil. Boil for 2 to 3 minutes until slightly reduced, making sure the sugar does not burn, to make a glaze and sauce for the steak. Grill the steaks until an internal temperature on an instant-read thermometer reads about 130 degrees F, 3 to 4 minutes per side, brushing with the boiled marinade several times in the last few minutes of grilling time. (If you are cooking the filet mignon steaks, you will need to increase this time to 8 to 10 minutes per side to account for the thicker cut). Transfer to a large plate to rest for 5 to 10 minutes. While the steaks grill, add the potatoes to the grill and grill until well-marked and crispy, turning to grill all sides, about 5 minutes total. Transfer the potato wedges to a bowl. Toss the grilled potatoes with the remaining 1 tablespoon oil, chives, vinegar and salt and pepper to taste. 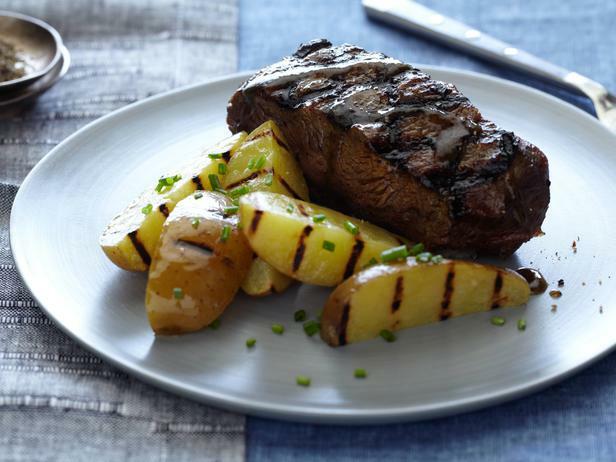 Remove the garlic cloves from the remaining glaze and serve drizzled over the steaks with the potatoes on the side.